When it comes to serving Thanksgiving dinner in our household there is only one menu: Warren’s mom’s. I’ve made the same New England Thanksgiving dinner for more than twenty years. The celebration always starts with assorted homemade pickles and relishes, and basketful of piping hot Parker House rolls. Then follows roast turkey with oyster stuffing accompanied by mashed potato, creamed peas and onions, and mashed winter squash and turnip. Finally the dinner ends with apple and pumpkin pies served with vanilla ice cream or Vermont cheddar cheese. As always there will be plenty of leftovers. Since Warren forbids me to alter the Thanksgiving feast, I’ve become very creative with leftovers. This year I decided to make Chinese pumpkin pancakes with the leftover pumpkin pulp from making the pie. Traditionally there is no separate dessert course in Chinese cuisine. Both savory and sweet dishes are routinely served together. It often confuses foreigners visiting China when a sweet dish is served in the middle of the meal. Recently though many progressive restaurants are separating a sweet-dish section at the back of their menu, adapting to the western culinary culture. One very common sweet dish that complements other savory dishes is pumpkin pancake. 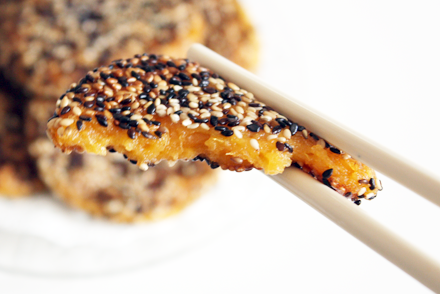 Chinese pumpkin pancakes are made from mashed pumpkin and glutinous rice flour. They are often coated with panko breadcrumbs or sesame seeds. After being fried till golden brown and crispy, they are served immediately while the inside is still soft and sticky. The texture is very much like Japanese mochi, but sweet and starchy with pumpkin flavor. To zest up the pancakes we need pumpkins that are sweet and flavorful. I like to use a variety called Kabocha. It has a dark green skin with beautiful orange meat. Sugar pumpkin with bright orange color and sweet meat, although less flavorful, is also a good choice. Regardless of whichever variety you choose be sure the pumpkin meat is steamed until tender for easy mashing. It is also important to mix in the glutinous rice flour while the mashed pumpkin is still hot. This should partially cook the flour, forms a more sturdy dough, and makes it easier to handle. Chinese pumpkin pancakes are very versatile and you can serve them as dessert or along side other savory dishes. So don’t wait until you have leftover pumpkin. Go out and get some pumpkin whenever they are in season and make pancakes. I guarantee you will enjoy them. 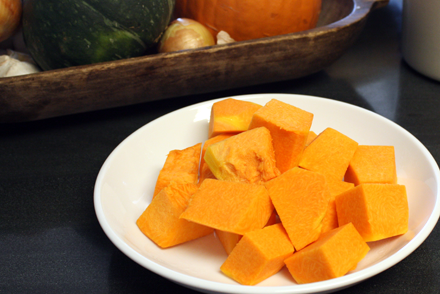 Peel and remove the seeds from the pumpkin, then cut it into about 2-inch squares. Place the pumpkin on a plate and steam over boiling water for 20 minutes or until it is completely soft. Remove from the steamer and drain any access water from the plate. Place the pumpkin in a medium mixing bowl and add the glutinous rice flour and sugar while still hot. Mix the ingredients together well until a smooth dough is formed. Divide the dough into 16 equal pieces. Roll each piece into a ball and press down to form a disk of about three inches in diameter and about 1/4 inch thick. In a shallow bowl spread the sesame seeds. 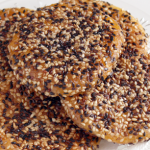 Coat the pumpkin pancakes completely with sesame seeds by patting the dough down onto the seeds. 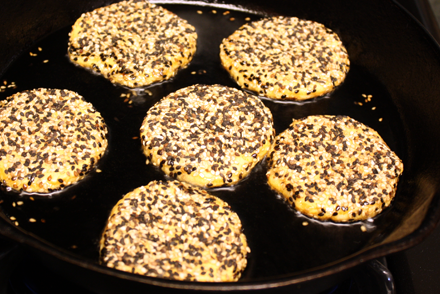 Heat about 1/4 inch of vegetable oil in a medium (10 inches diameter) frying pan over medium heat. When the oil reaches about 300 F place eight of the pancakes onto the frying pan and fry for three to four minutes or until the side is golden brown. Flip the disk and brown the other side for three or four minutes. Remove the pancakes from the pan and place them on a paper towel to absorb excess oil. Repeat the frying with the rest of the pancakes. Serve the pancakes while they are still hot. I’m totally captivated by this approach to pumpkin pancakes, particularly the seed coating and use of rice flour here. Whether prepared as a sweet or possibly in a savory version, this would make an ideal fall side dish for virtually any meal. Thank you so much for sharing this delicious idea! this looks DELICIOUS. i’ve never heard of pumpkin pancakes before — this is a northern thing? you had me at the sesame seeds! Betty, Pumpkin and glutinous rice flour are natural together in Chinese cooking. 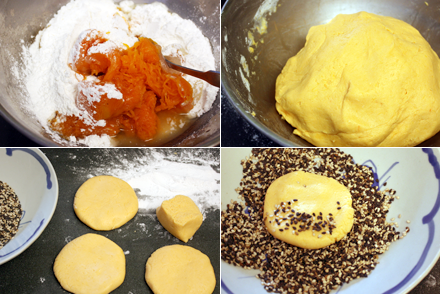 In fact this pumpkin dough can be used for making steamed cake as well. It is mostly served from the Yangtze River delta region through the northern region. So I supposed it can be considered northern cooking. These look yum. You’ve made these pancakes sound straightforward to make. I’ll try it in our Christmas menu this year. I had these pumpkin “nuggets” while I was in the Heilongjiang province. This recipe is great. I just have one question. Is there something else that people tradition coat the “nuggets” with? The toasted sesame flavor was delicious, but overpowering to me. Would you recommend powdered sugar or anything else as a substitute? Jon, You can coat the pancakes with panko breadcrumbs when frying. Daub the pancakes with some beaten egg then coat the panko. Do not use sugar when frying as it will caramelize too quickly and burn the outside of the pancakes. You can however dusk the pancake with powdered sugar for decoration after frying. Hi Kian, I wonder if the same concept applies to sweet potato? I imagine if one mashes up the potato and uses less sugar, a batch of reddish-orange sweet potato pancake can be produced. I’ll try this soon. In my head, it makes a lot of sense…. Yes, I think sweet potato would work really well with this recipe. Just make sure you adjust more moisture to the dough. Pumpkin is a lot more moist than sweet potato. Do u have any of the steam pumpkin cake recipe that you could share with us ! I don’t have a fully tested recipe for steamed cake. I do remember enjoying a wonderful pumpkin steamed cake with pumpkin seeds and goji berries in Hong Kong. It was wonderful. I will have to develop and test a recipe of this in the future. Stay tune. These were delicious! 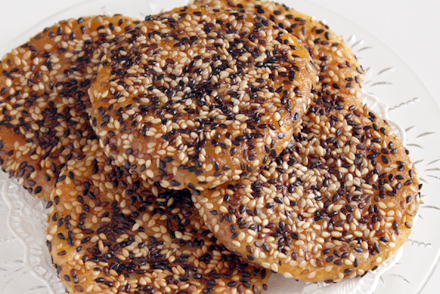 With the sesame seeds they are a more sophisticated version of what we have at our local dumpling place. Put the dough i didnt get through in the freezer. hope it works. Thanks I love your blog. Looks awesome, but can I use pumpkin purée instead? And how much? Yes, you can use pumpkin purée for this recipe. Use about the same amount, which is 8 oz. of pumpkin purée. Enjoy!